The other night, my hubby surprised us all with a dessert that the country kids had never had before. He whipped up some yummy baklava! It was so yummy, the youngest country kid snitch a second piece when no one was looking. So how do you make this yummy creation? Well according to my hubby it’s easy! Just a lot of buttering up layers…. lots and lots of layers. Phyllo dough is sold in frozen packages, so you need to remove the package from the freezer and let it thaw in the fridge 24 hours before you want to make the baklava. For best results, remove the phyllo dough package from the fridge about an hour before you plan to start so it will be easier to handle. Start by preheat your oven to 350 degrees. Toss the chopped walnuts and cinnamon together in a bowl so the walnuts become evenly coated with the cinnamon. Next grab a 9×13 pan to “construct” the Baklava in. You will want to butter the bottom and sides of the pan. Unroll the sheets of phyllo dough, so the stake of dough lays flat. Compare the dough sheet size to the size of your pan and trim the stack of sheets to pan size so they will fit properly. This will make the process go a lot faster. Also Phyllo dough dries out fast. Cover your dough with a damp paper towel. Only remove a few sheets at a time to work with. Begin by putting down one layer of dough and brush it with some melted butter. Easy, right? Now just repeat this 9 more times. I told you there were lots of layers! Once you have 10 layer of buttered dough, spread 1/3 of the walnuts on top. On top of the nuts make three more layers of dough, buttering each layer as you go. Grab another 1/3 of your cinnamon walnuts and sprinkle them on top. Next add three more layers of dough (don’t forget the butter) and top with the rest of the walnuts. Finish up by making 10 more layers of dough, buttering each layer as you go. Yes, there are a lot of of layers (26) and a whole lot of buttering going on, but it is just straight forward repetition. This would be a fun project to include a child in, allowing them to brush on the melted butter as you place each layer. Now BEFORE you bake your baklava at 350 degrees for 35 to 45 minutes (until the top is nice and brown), slice the pan of dough into small squares. You can also cut them in a crisscross pattern to create diamond shapes. While the baklava is baking it is time to take the water, sugar, honey, vanilla, squeeze lemon juice and nutmeg and bring to a boil in a saucepan. You will let it boil till the sugar sugar dissolves completely. Make sure to stir so that the sugar doesn’t burn. Once the sugar melts you will remove the saucepan from the heat letting it cool. When the baklava is done baking, pour the syrup you made over the top of the baklava. Allow the baklava to to cool for at least 3 hours, this will give it time to absorb all that yummy syrup. Now if you are like us….. you just eat the baklava. But if you want to serve these for a special occasion, give them as a gift. or just add a touch of “finery,” you could put each piece in a cupcake wrapper as part of their presentation. Mmmm…that sounds (and looks) delish!! I'm salivating reading this! Thank you for sharing this recipe with Fabulously Frugal Thursday. One quick question – can you vary the nuts? I'm not sure what traditional baklava uses. Walnuts and pistachio are traditional but you can use what ever you want! Like cashew or maybe macadamias. Looks WONDERFUL! Thanks for sharing the gorgeous photos and recipe. Will definitely give your hubby's recipe a try! Oh my goodness that looks delicious!! Thank you for coming by today, I appreciate it!! Yum Yum Yum!!! Thanks so much for linking up to “Tuesdays with a Twist” blog hop! Not sure what I love more, how delicious this recipe looks or the fact that your husband surprised the family with it. I say that hubby made it! LOL I love to bake but it is nice to get something yummy when you didn't have to do all the work! This looks so good! I love baklava. We use to have it for dessert at a Greek restaurant in Tarpon Springs, FL when we would visit my grandparents. I always have great memories coming flooding back when I eat it! Can't wait to give it try. Thanks! Just think, if you can make it at home, when ever you need a warm memory, just bake! Ohhhh I love fresh baklava! now I can make my own – any time, all the time!! and then eat it all myself! woot! Ok I might share 🙂 Thank you for sharing the recipe! Don't share LOL Hide it all! That looks like something I could actually do. And my whole family LOVES that wonderful greek stuff I can't spell! That's a surprise of the good kind! It looks delicious! I love how golden brown and crispy the phyllo looks. Looks delicious! I wish my husband would surprise me with such a treat! 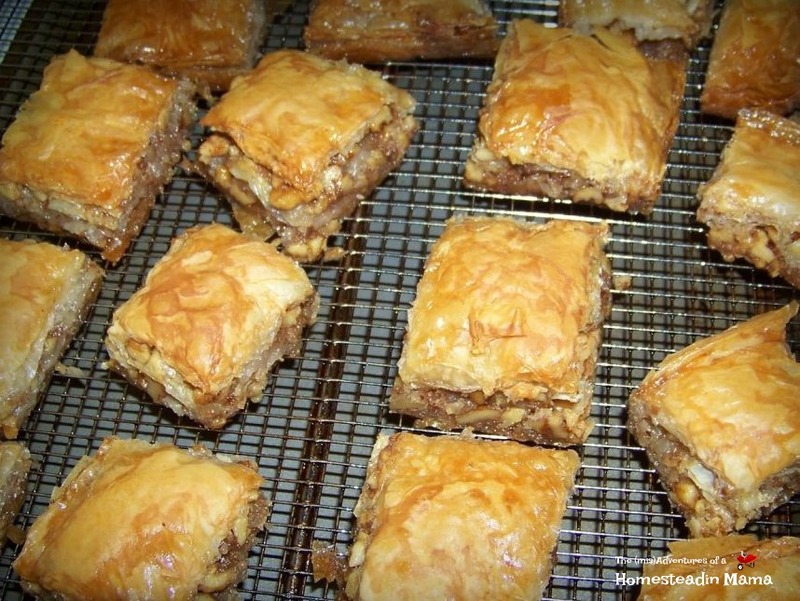 I love baklava, but have never made it! Oh, I wish my hubby would make me some! I guess I better make my own! This looks delicious! I never thought of making Baklava at home but now that you have shared the recipe, may be I should try. Thanks for partying with us at WUW. And just think, now you can be the neighbor that makes it and shares! looks really yummy! I love baklava but I don't love making it! My best friend made it for my guests at my wedding and everyone loved it! It is also considered a "wedding treat" here in Greece. First time here, stopping by from My crafty spot Sunday link up! So glad you popped by. I hope you enjoy looking around. Baklava is a little time consuming but not that hard. Where we live it is not readily available, so it is make your own or miss out. Wouldn't miss it! Thanks for popping by and pinning. Hope you get the chance to whip some up! This sound delicious! My mom loves baklava, but neither one of us ever seem to take the time to make it. Thanks for linking up with us this week at Your Turn to Shine. I hope you can join in again! I love baklava!! It's crack to me. This looks fabulous! I can't wait to try it. Thanks for linking up with #FoodieFridays! Well then I am glad to help your addiction! Yum. Your baklava looks heavenly! Anyway to make a diabetic friendly version? WOW!! Looks delicious!! I think we might have to try it! Just keep buttering and layering! Just found this on the Homestead Blog Hop and cannot wait to try it. I love baklava and homemade is the best. I was wondering about making the dough from scratch, do you know of a good recipe? Thanks for sharing! If you want to try to make the dough from scratch, more power to ya! I’ll keep this recipe easy for our family and just buy it. LOL Some times a little give is okay and I give when it comes to making the dough. I love baklava, but I’m not sure I have the patience for all that brushing. Bet homemade tasted better than shop bought though! You get a rhythm going, it’s not bad, I promise! I made baklava 1 time. It sure is delicious but seemed to take a long time to put together! Yours looks wonderful! This sure looks yummy! I love baklava but I have never thought to make it myself. Pinned. Baklava is one of my favourite treats! Well done to your hubby! Sharing later today on the Hearth and Soul Facebook page. Thank you so much for being a part of the Hearth and Soul Link Party, Mindie! Hope to ‘see’ you again this week! 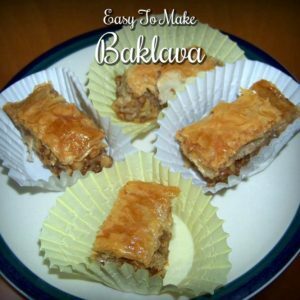 I have always thought baklava looked so delicious but I have never tried to make it–maybe you have inspired me! Thanks for sharing at Party in Your PJs! I love a good Baklava and yours looks delicious!! Thank you for so much love! And for hosting such a great link up every week.